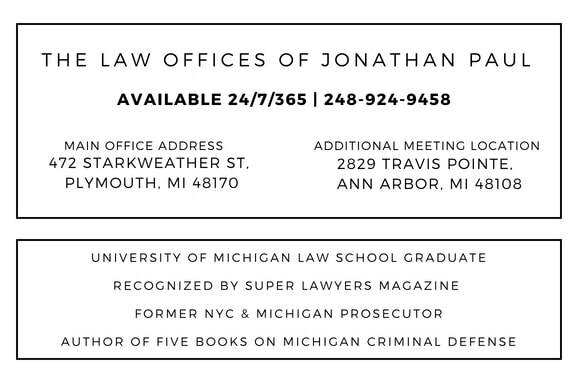 When arrested for drunk driving in Michigan, the police officer may or may not confiscate your physical license. If you have a Michigan license, the officer may take it away, and destroy it, issuing you a temporary paper license. Under MCL 257.625g(1), a Michigan license will be confiscated for either (1) refused a request for a chemical test at the time of the arrest or (2) took a chemical test that was offered by the officer or performed under a court order and that reveals an unlawful alcohol content. Here are the possible sanctions on your driver's license. If you have an out of state license, Michigan can only issue these sanctions for driving in Michigan, and NOT the other 49 states; it is up to those states to take their own action. If convicted of Operating While Intoxicated your license will be impacted for 180 days, with a restricted license available for all or a specified portion of this suspension except for the first 30 days. If convicted of Operating While Visibly Impaired, your license suspended for 90 days, with a restricted license available for all or a specified portion of this suspension. If convicted of Super Drunk, your license suspended for 1 year and may drive only after 45 days and the installation of an interlock device. If convicted of a Minor BAC/Zero Tolerance for being under 21, the Secretary of State must suspend your license for 30 days and may issue a restricted license during all or a specified portion of the suspension. If convicted of OWI due to a controlled substance (or a combination of intoxicating liquor and a controlled substance), the Secretary of State must suspend your for 180 days, with a restricted license available for all or a portion of this time. If you have prior convictions, your license could be more severely impacted. With one prior in the last 7 years, a driver's license is revoked rather than suspended for one year. The license of a driver who has three or more convictions within 10 years will have their license revoked for at least five years. One exception to the above license actions due to priors, could be entry in sobriety court, which allows for restricted driving for those enrolled in and complete an approved driving while intoxicated (DWI)/sobriety court program. The restricted license allows the person to operate a vehicle with an interlock device. A major consideration for any client of mine is the impact on their license; no matter what you're actually charged with, it does not mean that will be the outcome of your case. There's deals to be made, leverage to be created, and cases to be dismissed or won at trial. You should begin planning for possible sanctions, but not assume the worst case scenario without exploring alternative outcomes.